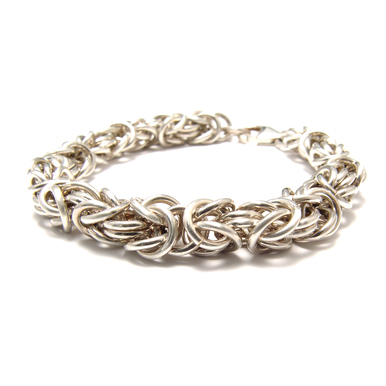 Join Colin for this great introduction to chain making. In this class you will learn the basics of how jump rings are made and how to open and close jump rings properly. Colin takes you through the steps for making the 2 in 1 chain, 2 in 2, as well as the 3 in 3 chain. After you have learned to make these chains, you will move on to making jump ring flowers and different ways to link them together. This class is a great starting point for those wanting to explore the world of chain making. Start your chainmail addiction today! This class has a running time of 23 minutes, 18 seconds. Excellent tutorial! Colin is very concise and easy to understand. I like the list at the end of each segment that serves to remind me of the sizes of jump rings to use. I also like that she makes reference to relevant tutorial classes such as how to make your own jumprings. Thank you, Beaducation! You never disappoint. So informative. Another great Beaducation tutorial. Great class! 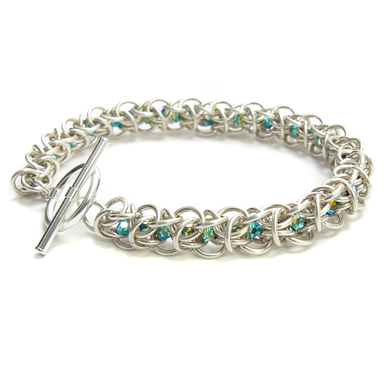 I was interested in chain mail and just got the supplies to make this amazing jewelry. Very easy to understand. Thank you ! easy class for this beginner. very good step by step instructions! Great demonstration. Drags a bit for me but I have done chain mail me before.